When the Catalan architect Antoni Gaudi i Cornet (1852-1926) was fatally injured by a Barcelona tram in the summer of 1926 there was another less obvious victim. As Gaudi lay dying Modernism--Barcelona's particular brand of Art Nouveau architecture--was also breathing its last. For a time, it seemed that his great and foreboding work, the church of the Sagrada Familia, would also succumb and fall into ruin. Of course construction on the church continues to this day--even unfinished it has become Modernism’s greatest monument and Barcelona's biggest tourist attraction. But with Gaudi's death Modernism had run its course. It had lasted 40 years and bequeathed to the Catalan capital a unique patrimony. Most visitors to Barcelona are familiar with Gaudi but there were two other great Modernist architects. Certainly Gaudi deserves the attention but Lluis Domènech i Montaner (1850-1923) was perhaps most responsible for Modernism’s origins. In the 1870s Domènech i Montaner was absorbed in defining a Catalan architecture incorporating Greek, Gothic, Egyptian and Islamic elements while using modern technologies. There was another element to Modernism that most visitors to Barcelona are unaware of. It was a style that was rooted in the fevered soil of 19th century Catalan nationalism--Gaudi would at times only speak in Catalan refusing to speak Spanish. The first Modernist building is considered to be the Cafe Restaurant erected for the 1888 Universal Exposition and which still stands in Parc de la Ciutadella. Appropriately it is the work of Domènech i Montaner. The triumvirate of Modernist architects was rounded out by Josep Puig i Cadafalch (1867-1957), also an intense Catalan nationalist, and like Domènech i Montaner, an active politician. The nationalism of Gaudi, Domènech and Puig manifests itself in details that often appear in the ornamentation of their works. Like England, Catalonia's patron is St George, and both the saint and his dragon are often featured in Modernist ornamentation. The rest of Spain maintained a certain ambivalence toward Modernism, it was too Catalan and therefore fit to be ignored by the rest of country. That is why Modernism is almost exclusively restricted to Barcelona and the area around it. Modernism was a flash of whimsy with its bizarre combinations of curved masonry, dark and sweeping wood panels, colourful tile work and shingled roofs that look like the backs of giant dragons. It was also a style that required exquisite workmanship and skilled craftsmen in a way that makes it almost unreproducible today. Initially Modernism had been inspired by Gothic architecture, which also abounds in Barcelona, but it was also influenced by forms and shapes that appear in nature--tree trunks, butterfly wings, or mushrooms--rejecting straight lines and regular sections. Modernist buildings are found throughout the Eixample area of Barcelona, the part of the city with the uniform grid of blocks. There are approximately 2000 buildings in the city with Modernist elements and many were demolished during the dictatorship. Fortunately the remaining buildings are now protected by law. One could wander about craning up trying to pick out Modernist buildings here and there. However, if you have a limited time in Barcelona it is more productive to concentrate on the area centred around Passeig de Gràcia and Avenue Diagonal. It also happens to be where Gaudi's Casa Mila (1905-11) is located. I would like to suggest the following tour which can be accomplished during a leisurely morning’s stroll. Located just north of Avenue Diagonal on Passeig de Gràcia are two examples that illustrate contrasting interpretations of Modernism by different architects. At number 113 is Casa Bonaventura Ferrer (1906) now a hotel and the work of Pere Falqués i Urpi (1850-1916). A somewhat dark and foreboding building with its carved stonework and iron balcony railings of Baroque inspiration. 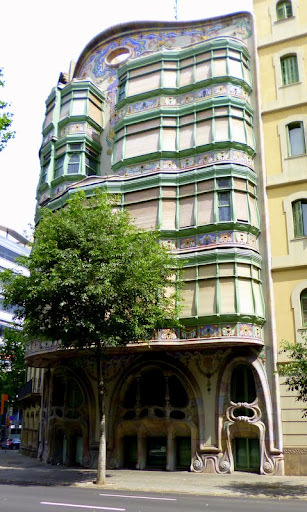 A little further north where Passeig de Gràcia narrows is Casa Fuster (1908-10), also a hotel and the work of Domènech i Montaner. Casa Fuster’s restrained facades contrast with that of Casa Bonaventura. There is a hint of Egyptian architecture in the columns of Casa Fuster. The corner turret supported by a single central column keeps the sidewalk free and uncluttered. Step inside Casa Ferrer and have a look at the multi-vaulted ceiling over the bar and restaurant. Casa Fuster’s north facade, which overlooks a pedestrian walkway demonstrates, the care lavished even on a facade that would normally get little attention. The carved stone work around the numerous windows is striking. Returning to the corner of Passeig de Gràcia and Avenue Diagonal walk one block east to the corner of Carrers de Corsega and Pau Claris to Casa Comalat (1909-11). This apartment building has two very different facades while the interior and exterior decorations are unlike anything else in Barcelona. The facade facing Carrer de Còrsega with its use of terrazzo--concrete embedded with pieces of quartz and polished to a smooth finish--is stunning as is the intricate tile work on the vertical surfaces and soffits of the overhangs. The main facade on Avenue Diagonal is very different, dominated by massive Baroque-like stonework likely influenced by Gaudi but the building is in fact the work of little-known Salvador Valeri i Pupurull (1873-1954). The overall effect may not be to everyone's taste but Casa Comalat highlights the level of workmanship that often marks Modernism. Through the vestibule doors you can get a glimpse of the interior decoration. Across Avenue Diagonal from Casa Comalat is the Palau de Baró de Quadaras (1904) but commonly known as Casa Asia. It is an example of Puig i Cadafalch's elegant vision full of elaborate ornamentation using brick, wood, tile and ironwork. Casa Asia houses a cultural association and is open to the public during business hours. Take the stairs up to the second floor to get a taste of what was originally a private residence. The interior decoration is somewhat dark. However, this building like Casa Comalat has two street facades as it is located at the narrow end of a wedge-shaped block. The result is lots of windows on the upper floors to let in natural light thus diminishing the effect of the dark interior finishes. It is a short walk from Casa Asia along Avenue Diagonal to Casa Terrades (1903-05), colloquially known as the House of Spires for its turreted towers topped with steep pointed roofs. This medieval looking apartment block is also the work of Puig i Cadafalch and was built for three sisters. The building divided into three distinct parts, one for each sister, is highly detailed in its ornamentation. Ceramic panels throughout the facades depict nationalist elements including one with St. George that is inscribed "Holy Patron of Catalonia, give us back our freedom." From Casa Terrades walk south along Carrer Roger de Llùria for two blocks to Carrer Mallorca. On the southwest corner of Carrers Llùria and Mallorca is the Palau Montaner (1893). It now serves as offices for the Spanish government but originally it was a private residence designed by Domènech i Montaner. It is an early example of Modernism and as such it has a restrained aspect to it, lacking the exuberance of later buildings. Perhaps it was a more welcoming and comfortable space for the wealthy bourgeois family that commissioned the building. The lanterns in the form of dragons on either side of the main entrance again touch on Catalan nationalist imagery. On the next block over on Carrer Mallorca is located Casa Thomas (1895-98) an outstanding example of Modernism but usually overlooked as one walks past because it is best viewed from across the street. 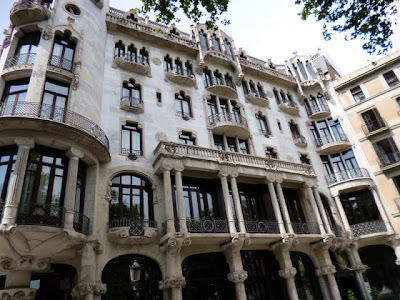 It was originally a two-storey structure designed by Domènech i Montaner but in 1912 was enlarged into an apartment building by the architect’s son-in-law Francesc Guàrdia i Vial. The style is neo-Gothic with flourishes of floral elements. The lower floors now house a furniture company and during business hours you can have a look at the decorations of the entrance hall and the wrought-iron railing of the main staircase. Continuing along to Carrer Mallorca number 302 we come to Casa Vallet i Xiró (1912-13) the work of Josep Barenys i Gambús (1875-1953). It is interesting to contrast this building with its neighbours on either side. Often the line between elegance and kitsch is very fine and this is evident here especially when we contrast Casa Vallet with the building at number 300. The latter building features bizarre columns between the fourth and fifth floors with huge vases on the sixth floor. The effect is something like a Piranesi draughting exercise, and not to everyone’s taste. Meanwhile Casa Vallet is more subdued to an altogether more attractive effect. The wrought iron railings on the upper balconies of Casa Villet are very fine work. From the corner of Carrers Mallorca and Bruc head toward the sea along Bruc one block to the corner of Carrers Bruc and Valencia. Dominating the intersection are the twin spires of the Conservatori Municipal de Müsica (1916-28). The work of Antoni de Falguera i Sivilla (1876-1947) and an example of late Modernism with obvious influences of Puig i Cadafalch. The effect is restrained, the ornamentation is plainer, that and the long construction period, perhaps reflects the constrained economic times of post-WWI. As the conservatory is a public building you can step inside during business hours and view the main staircase just inside. The simplified decorations contrasts with those of earlier buildings. Perhaps now is good time for a pause and some refreshment. Next door to the music conservatory is the Mercat de la Concepció (1888) one of Barcelona’s municipal food markets. There are a number of cafes inside under the market’s ornate cast-iron structure, itself a fine example of early Modernism. From the market there are various options to continue your tour. The immediate area has many other buildings of interest. You could walk to nearby Casa Mila or take a short taxi ride to Sagrada Familia. Barcelona Modernism will not fail to fascinate. If you can manage it plan your tour to coincide with the work week, that way you can gain entrance to some of the public buildings. Winter and early spring are good times to view buildings as the trees are bare of leaves. 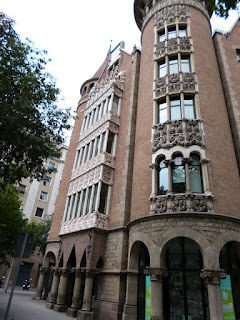 A good place to start a Modernism tour is at the Palau Robert at the intersection of Passeig de Gràcia and Avinguda Diagonal. 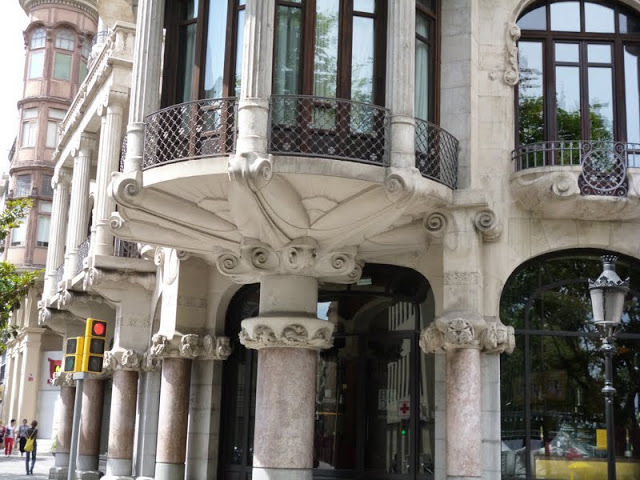 The Palau Robert is not a Modernist building but it houses the Generalitat’s (the Catalan Government) main tourist office open seven days a week. At the desk ask for the publication Modernism, Art Nouveau in Catalonia (available in various languages) and for the multi-lingual map Ruta de Modernisme de Barcelona, both free. Then you can sit in the lovely shaded garden behind the Palau Robert to plan your excursion. One aspect of Modernism that a street tour will not reveal are the internal furnishings. A number of organizations have collections of Modernists furniture, sculpture, ceramics and paintings. 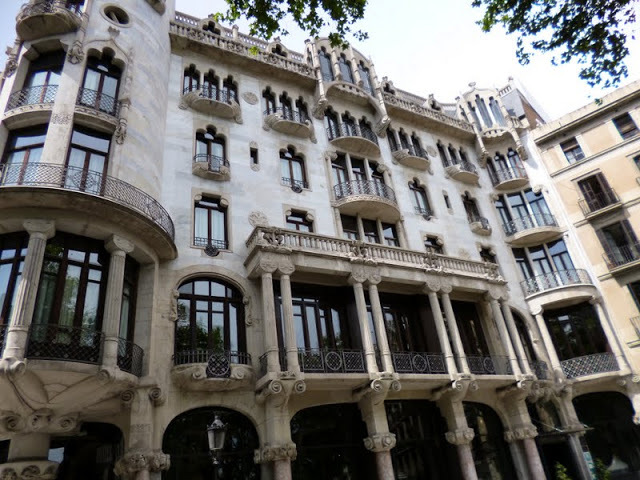 These include MNAC (Museu Nacional d’Art de Catalunya), the private Museu de Modernisme Catala and Casa Mila has a furnished apartment suite open to viewing when you tour the building. The interior of Palau de la Musica Catalana is most spectacular and the building can be visited with the aid of an English speaking guide. If you visit the Sagarda Famila consider having a look at the Hospital de Sant Pau, a 15-minute walk away along the Avinguda Gaudi, a street that links the two sites by cutting diagonally across the street grid of the Eixample. The hospital is the work of Lluís Domènech i Montaner and it consists of several pavilions on a huge lot. If you are an aficionado of Modernism it is well worth a look. 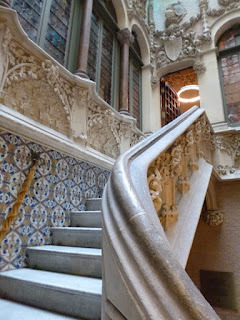 There are a number of companies offering guided tours on various architectural aspects of Barcelona including Modernism. In this time of economic crisis in Spain some of the guides happen to be underemployed architects who have in-depth knowledge of the subject. Finally, some suggested reading. The late Robert Hughes’s Barcelona is an excellent and very readable history of the city up to the early 20th century. Hughes writes extensively on the work and influence of Gaudi, Domènech i Montaner and Puig i Cadafalch. The Hughes book is still in print. Irish writer Colm Tóibín’s Homage to Barcelona a good account of the city’s culture including its architectural heritage. Out of print but available at many UK libraries is Alistair Boyd’s The Essence of Catalonia, basically an architectural tour of the Catalonia with a good section on Modernism.